Shown below are one complete parasequence and parts of two additional parasequences, all developed along on a tidal flat. At the 1.5 meter high jacob staff at the bottom, note the upward-thinning of the sandstone beds, ultimately ending in a thick mudstone facies, demonstrating that although most parasequences are shallowing-upward, not all are necessarily coarsening-upward. The flooding surfaces at the base and top of this parasequence are indicated by the yellow lines. 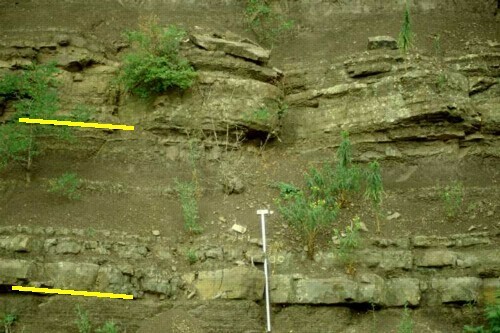 This photograph was taken in the Ordovician Juniata Formation near Germany Valley, West Virginia.